I'm a sucker for a fantasy comic especially if it's based on mythology. Norse mythology, in particular, is full of great stories just ripe for the adapting. 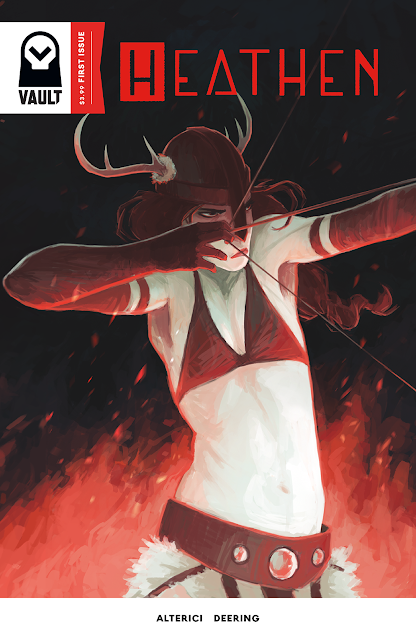 Natasha Alterici has created a wonderfully empowering and exciting new series for the emergent comic book publisher Vault Comics in Heathen #1. Aydis narrates the opening about the leader of the Valkyries who defied the Godking Odin and was cursed, exiled, and forced to marry a mortal. She set her own terms and sat atop a hill waiting for a worthy suitor. In some ways, the story mirrors Aydis' circumstances now. She's a rebel too, strong-willed, capable, and a warrior in her own right. She's on the run, accused of an "unnatural" act and on a quest to challenge the gods herself. Alterici has written and illustrated a powerful debut issue. This seemingly straightforward adventure tale has layers to it that address patriarchal societies, sexual identities, discrimination, oppression, and equality. It sounds like it could be some heavy-handed topics but Alterici's approach is so fluid and seamless, such ideas are woven into the fabric of Aydis' journey without weighing it down. And like any great first issue, the ending leaves you wanting more. The art is scratchy, sparse, and works perfectly. Alterici takes great care in presenting her hero in the best light, choreographing not only singular panels that stand on their own but action sequences that thrill and surprise. Her eye for layouts gives 'Heathen' a look and pace of confident storytelling. She knows exactly where the story is going and I found myself under her spell, succumbing to the charm of the engaging and inspirational Aydis. 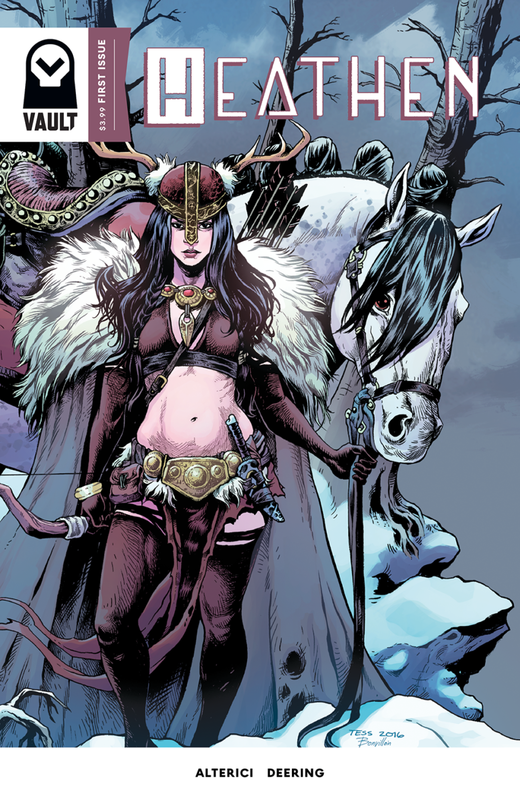 'Heathen' #1 is another top shelf offering from Vault Comics. Natasha Alterici has created a fantastic new fantasy adventure series with a great new leading lady as tough as Red Sonja or Dejah Thoris. The comic mixes high adventure, Norse mythology, subversive social commentary in a fast-paced thrilling story. This is a must-buy this week.